Sites will have to pay an ad coalition to evade a blockade by the world's most popular browser. Google yesterday announced that it will start blocking ads in its Chrome browser on Feb. 15. Websites that want to avoid the Chrome hammer can either shed several broad categories of online ads or pay a consortium of advertisers, advertising trade associations and technology companies, including Google, Microsoft and Facebook, to become "certified." "Starting on February 15, in line with the Coalition's guidelines, Chrome will remove all ads from sites that have a 'failing' status," Google said on its website, referring to the Coalition for Better Ads (CBA), a group that's promised to scour the web of the most annoying advertisements. Chrome's ad-blocking timeline matches what Google said six months ago, when it confirmed that it would launch the controversial effort in early 2018. At the middle of February, most users will be running Chrome 64, now slated to release the week of Jan. 21-26. The current version of the browser is Chrome 63. On the desktop, Chrome will block four types of advertisements (out of six considered), while on mobile - iOS and Android - the browser will bar eight kinds of ads (out of a dozen scrutinized): These categories were identified by the CBA and its consumer panel as the least acceptable. The four ad classes to get the ax on the desktop include pop-ups, ones that automatically play video and audio, "prestitial" ads accompanied by a countdown clock, and those dubbed "large sticky ads," which blanket more than 30% of the screen and remain in place no matter how furiously the user scrolls. Rather than block those ad types on all sites - as most ad-blocking browser add-ons do - Chrome will take a different tack. The browser will rely on a whitelist generated by the the CBA. Site publishers will be able to start the certification process, and thus secure a spot on the list, next month, when more details will be made available. Certified websites must meet certain standards, the most important being a low ratio of unacceptable ad types. In the first two months of the project - the start date will be revealed in January, the CBA said - disreputable ads must not account for more than 7.5% of all page views on a certified site. The cutoff falls after that, so that after six months, ads can comprise just 2.5% of a site's page views. In effect, the CBA will let certified sites ease into the blockade, with a smaller quota of "bad" ads over time. Sites that do not "volunteer" to become certified by the CBA, or are judged by the organization to be non-compliant - effectively all sites but those on the whitelist - will have ads in the banned categories blocked. Even a single objectionable ad will trigger a block by Chrome. Although the CBA revealed some specifics about the standards, the whitelist and how sites can contest the ad blocking decision, much of the program remains a black box. It was unclear, for instance, how often sites would be re-evaluated for violations, or how long it might take to appeal a ruling. Nor is there information about fees. Brendan McCormick, a spokesman for the CBA, said that payments would be required from most sites that seek certification. Although he stressed that there is much "to be worked out" between now and the January launch of the program, McCormick confirmed what AdAge reported Tuesday. Quoting an unnamed coalition spokesperson, the publication said that the CBA would charge the largest publishers up to $5,000 using a sliding scale. Some "very small publishers" may be certified at no charge. "A lot has not been finalized," McCormick told Computerworld. "There's still much to be worked out. The essential part is to make this affordable [to site publishers]." He declined to say whether fees would be one-time only, or assessed annually. Evaluations and certifications will begin in January, McCormick said, but he would not specify a timetable. Past attempts to craft a working definition of annoying online ads, and barring those from the web, or even subsets of the ad ecology, like the "Do Not Track" push nearly 10 years ago, have usually come to naught because of the competing interests of the major players. What's different about the CBA? "First, the Coalition has global support," said McCormick, "with membership of the leading companies and trade associations in every aspect of the [ad] supply train. Second, is the approach [the CBA] took to do extensive research about what consumers found below the threshold of acceptability. "Intuitively, people knew, but now we have a coherent and consistent view [of what an unacceptable ad is]," McCormick added. What he left unsaid was the participation of Google, and the massive stick that it will wield with Chrome. The browser will be the enforcer of the CPA's rules. Because Chrome is the most popular browser on the planet - the contest is not even close - publishers cannot afford to dismiss the ad-blocking project, as they have done others before, if site revenue relies on advertising. According to U.S. analytics vendor Net Applications, Chrome accounted for 61% of the world's desktop browser user share last month, meaning that more than 6 out of every 10 people who went online during November used Chrome to do so. Irish metrics company StatCounter said that 55% of the desktop browser usage share, an estimate of activity rather than the user base, came from Chrome in the same month. If Chrome shuts off the spigot, even if it blocks only the unacceptable ad categories, site owners will see a substantial drop in revenue. But it's questionable that Chrome will be able to narrowly target its blocking at only some ads on a non-compliant website. "We would like to be able to filter out only the non-compliant ad experiences, but this is technically very challenging," said someone identified as Brandon_L and a Google employee on a support thread devoted to the upcoming ad blocking. "The Chrome team is assessing the best way to approach this challenge. We are working with the Coalition for Better Ads on the enforcement details for annoying ad experiences and expect to have additional details and dates soon." 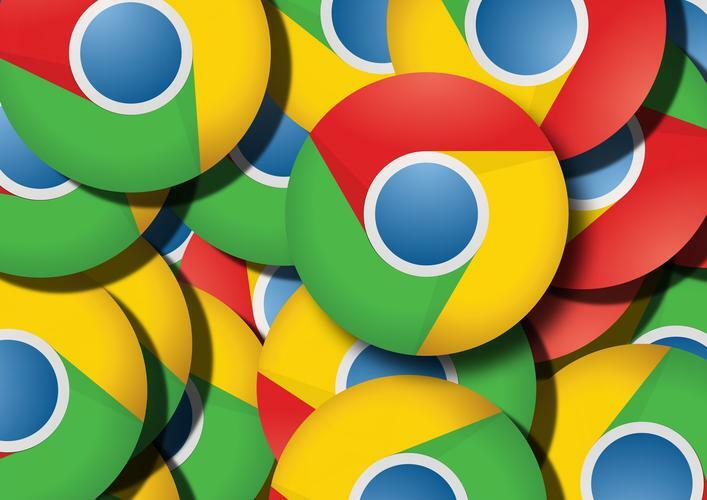 In other words, Chrome's ad blocking may end up being implemented on a site-wide basis. A non-compliant website may have all its advertisements filtered from what users see in the browser. Computerworld will continue to follow the Chrome ad-blocking story - the bulk of enterprise users now run that browser as well - as more details become available. 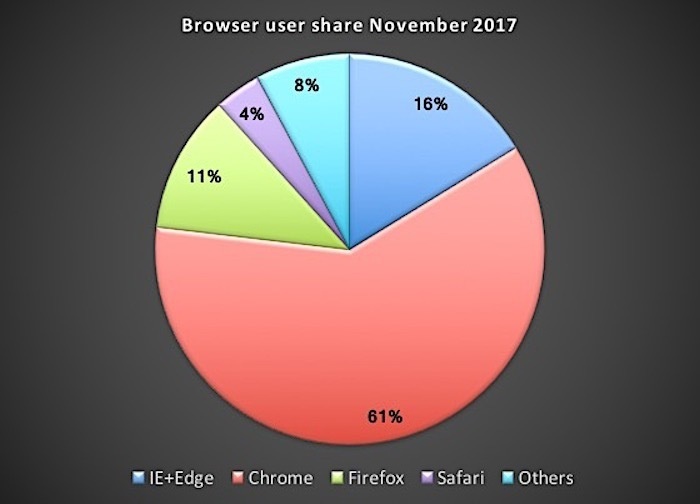 Chrome is easily the most popular web browser now in use based on statistics for November 2017.